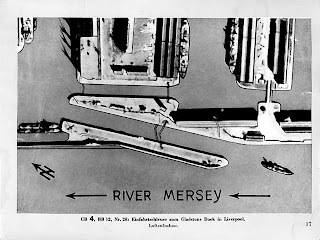 The Luftwaffe knew that Liverpool was the main port for convoys crossing the Atlantic from America. The river was full of all kinds of ships, both military and merchant. The Germans believed that if the port could be closed, Britain might starve. In a memo from Admiral Raeder, to Adolf Hitler in May 1941, he urged Hitler, “That an early concentrated attack on Britain was necessary, on Liverpool for example, so that the whole nation will feel the effects”. Liverpool was known to the Germans as a naval repair base of great importance. The city was also the home of many ammunition factories supplying the armed forces with the fighting material it so desperately needed. Additionally the H.Q. to the Western Approaches, based in Derby House, in this building some of the greatest battles in the struggle to keep the Atlantic sea lanes open were masterminded. The docks were defended in a number of ways; barrage balloons were deployed to stop the enemy planes flying too low, while fighters attacked the German bombers in the air. Burning decoy sites were also set up to distract the planes away from the city and Royal Artillerymen of the Anti-Aircraft Command manned anti-aircraft guns, ack-acks. There were four types of these ack-ack guns with the largest firing 55lb shells. The guns had to be set up away from houses because shockwaves from firing them caused structural damage to buildings. Also at night sound locators were used with searchlights measuring 150cm in diameter to find the enemy. It was very difficult to hit planes because of the range and distance from the ack-acks so the guns were not as successful as had been hoped. They were more effective as morale boosters or to put off bombers pilots. Despite the attacks Liverpool docks remained open, which was important for supplies not only for Liverpool but for the rest of the UK. The Luftwaffe however were not going to give up in their attempt to cripple the port and so it was that one of the worst disasters of the blitz took place in Liverpool involving the SS Malakand . Saturday 3rd May 1941 this was the date of the worst air raids that Liverpool had experienced, an estimated 500 German planes were said to have attacked the city that night dropping bombs from 10.30pm until 5am the next morning. Lewis’s and Blacklers were destroyed and the entire contents of the music library in William Brown Street were burned to a cinder. A panoramic view of the aftermath of the bomb damage in Liverpool. The Victoria monument in foreground and the burned-out shell of the Custom House in middle distance. By far the worst explosion of the night was the blowing up of the S.S. Malakand, a cargo steamer owned by Thos Brocklebank Liverpool. 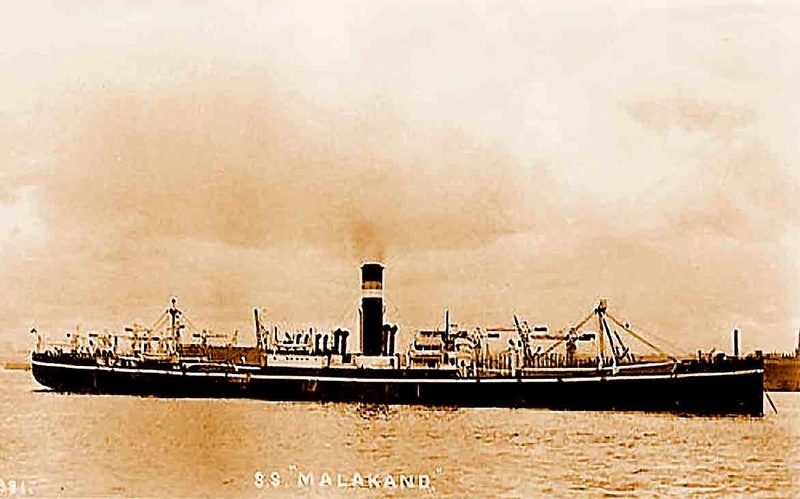 The Malakand was built by Lithgows Port Glasgow, In yard No 705 and launched on Saturday, 23rd November1918 she was fitted out in 1919 as a cargo vessel with a tonnage of 7649 (gross registered tonnage), she was 170.4 feet long with a breadth of 58.2 feet. She was named after the Malakand area of the Indian sub-continent. She was berthed at the Huskisson No-2 dock with over 1000 tons of shells and bombs destined for the Middle-east. No one knows how, but it is believed that one of the barrage balloons deployed to protect the dock estate slipped free of its moorings and became tangled with the ships rigging, it fell onto the deck of the Malakand and immediately burst into flames. The crew managed to extinguish the fire, however whilst they were battling the blaze incendiaries and high-explosive bombs ignited in the neighbouring dock sheds that had been bombed, the flames from these soon enveloped the stricken ship. 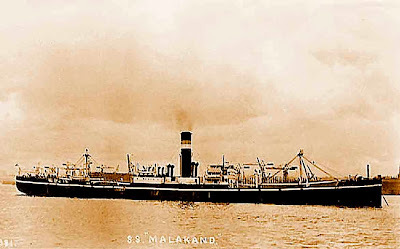 Though the crew did their best to save the ship it became clear that they were fighting a losing battle and the captain ordered the crew to abandon the Malakand. Captain Kinley the captain of the Malakand along with his crew and Auxiliary Fire Service personnel led by an Officer John Lappin, tried to scuttle the ship and prevent a terrible explosion. Their efforts were to be in vain and the ship exploded sending shock waves never before experienced in the blitz, through the city. 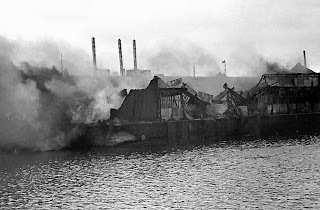 The devastation at the dock was immense and the entire dock was destroyed, the Overhead Railway line was severely damaged, The explosion was so violent that some pieces of the ship's hull plating were said to have been blasted into a park over 1 mile away. It took seventy-four hours for the fire to burn out. 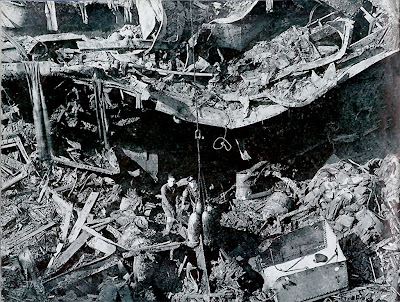 Despite the explosion being the biggest during the Blitz, only four people were killed, two of those belonged to the party who had tried so bravely to scuttle the Malakand, and a recently married couple who were said to be on their way home along the Dock road, when a huge fragment of the ship landed directly on their car killing them outright. Personnel seen hereRecovering unexploded bombs from the twisted hulk of the Malakand. 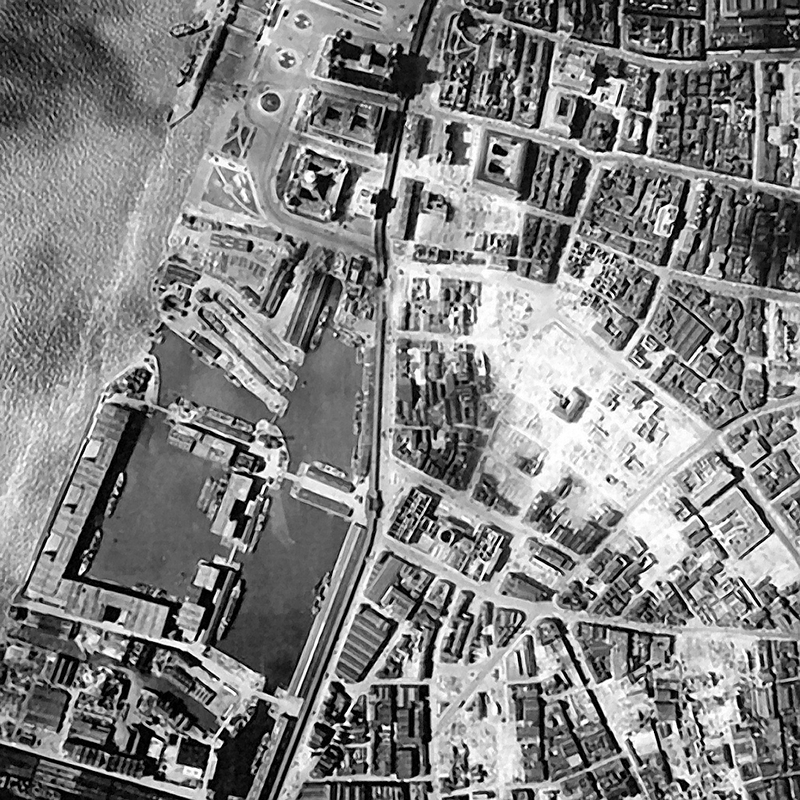 An aerial photograph taken by RAF reconnaissance on 11th June 1941, shows clearly the devastation caused by the bomb damage in Liverpool City Centre. 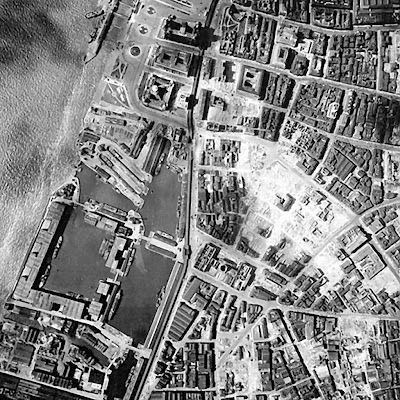 The Albert dock and Three Graces can be seen to the left of the image and swathe of destruction in Paradise Street and Derby Square is all too obvious.